One of our employees was the high bidder during the 2015 Gateway Friends of the NRA live auction. The friends of the NRA hosts banquets throughout the country to raise money for youth shooting sports and firearms education. Numzaan has donated safaris to banquets across the country. Seeing this as a “once in a lifetime” experience, Don was excited to bid on this item. He wrote the details of his hunt to share with us, and is looking forward to going back in the future. The 2016 Gateway Friends of the NRA will be held on March 5, 2016, in Maryland Heights, MO. If his story intrigues you, consider being a guest at the next live auction. I was lucky enough to have the winning bid on this donated hunt at the annual fundraising dinner and auction held by Gateway Friends of NRA in St. Louis, Mo. 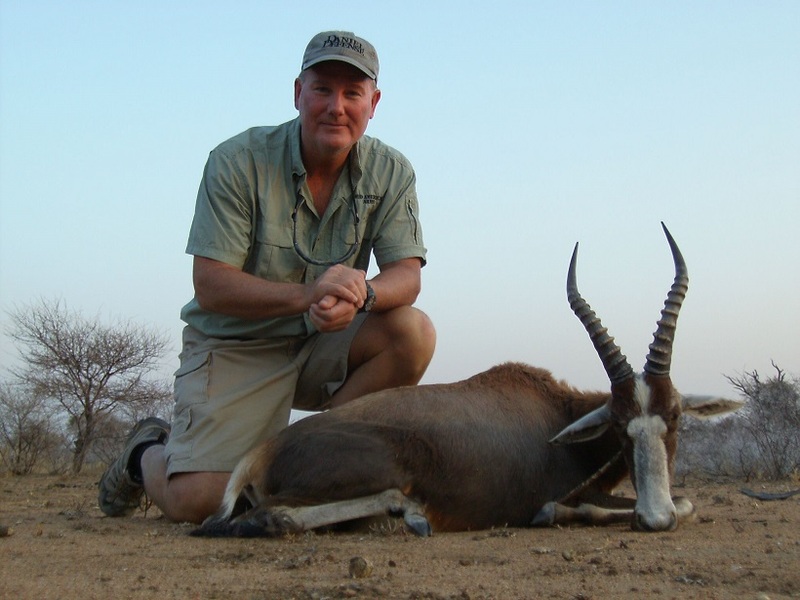 It was held March 21, 2015, and I was thrilled to be able to hunt this past August with the wonderful people at Kamboo Lodge, one of the fine accommodations from which guests of Numzaan Safaris can live out their African dream. The first trophy I took was a blesbuck, and I knew from this first time out that my PH (Naude) and I were going to have a blast. We did the spot and stalk method of hunting, which was a total change for me. I grew up in northern Wisconsin where stand hunting or deer drives are the standard fare. Naude showed why he has the Professional Hunter label when he spotted a band of seven animals walking away from us way off in the distance. He quickly got us in position to intersect their path and to get me a shot. A last second course change by the lead female threw a wrench in the plan and that put a huge bush between us, but I considered it a great hunt since they passed within 10 yards before they spooked and headed off in a trot. 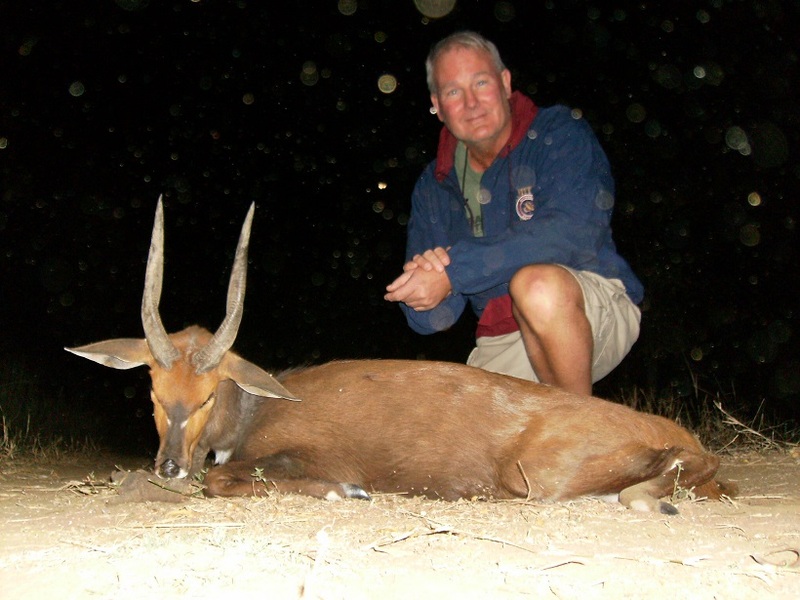 My second trophy was my bushbuck, and I have a newfound respect for this tough critter. My first shot with my 30-06 hit it perfectly in the heart-lung region from 40 yards away, and I don’t think it even flinched. It walked into some thick brush before I could get a clean second shot off, but I could see it licking the wound like it was a tick bite. We positioned ourselves for my second shot, but this also did not anchor it. Finally, Naude was able to get a third round into it before it expired. Only after getting it back to the truck for pictures and loading did I hear the stories about the bushbuck’s ornery temperament and the potential danger they pose to hunters. 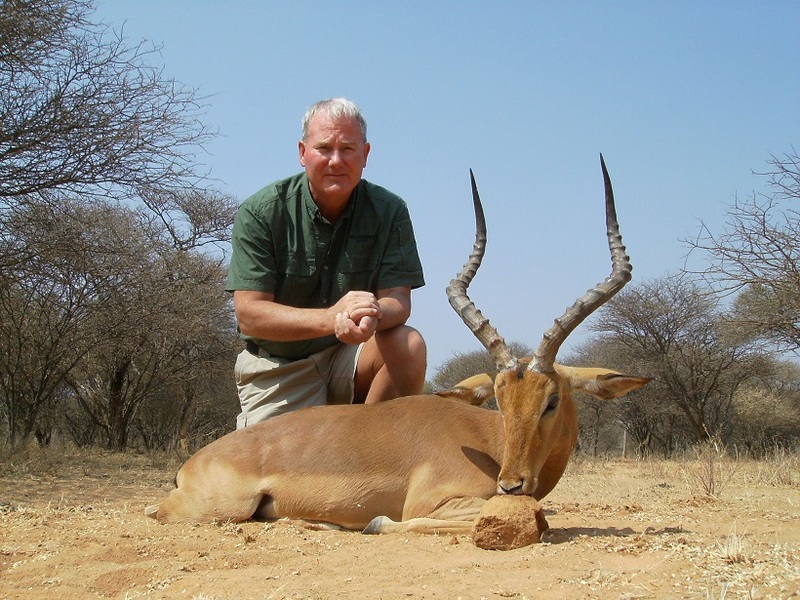 My third trophy was an impala that I took on a beastly hot day overlooking a waterhole. I spent a fair amount of time watching some young warthogs playing in the mud just trying to cool off. My mind was thinking of a nice cold drink when Naude leaned close and whispered, “Impala…take him.” Of course my heart rate went upwards of 100 in a nano second and instant anxiety struck when I couldn’t see the animal. I think Naude sensed this and extended his index finger in the direction I should look. After what seemed like FOREVER, I caught a glimpse of movement and an impala suddenly materialized, proudly strutting up to a small opening in the brush. From the opening in the blind in which I was to shoot through, I had a very narrow view of which I was able to cover the water hole. The problem was is that the impala wasn’t going to the water. He must have noticed something amiss or caught a scent that put him on alert. I have not observed many (ok-none) impalas but I knew this was a nice one. I was fidgeting internally because he wasn’t presenting a good shot and it looked like he was going to leave in an instant. He walked to my far right behind an old fence line and I was seriously thinking of popping up and taking an offhand shot of 40 yards before he hit the thick stuff. I nixed that idea when I realized how bad I was shaking. I decided to use the Jedi mind trick of trying to make him do what I wanted him to do. I’m thinking- turn around, turn around and come back, AND he does! Slowly he walks back towards the waterhole and I try to gather my wits to make a good shot. He walks back around the far side of the waterhole but he doesn’t stop. I’m so nervous because I don’t want to choke but he just keeps walking on past. I figure its now or never time because if he walks any further, he be too far to my left for a shot so I better be ready. As soon as I think that, he stops and I make a good shot. What a beautiful and majestic animal to have taken. 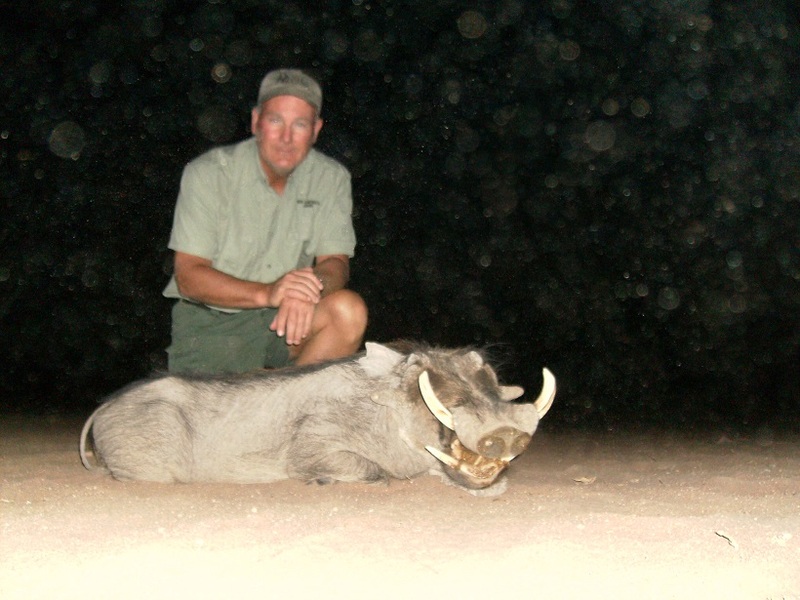 My fourth trophy was a warthog and once again it was something totally different for me. We spent the day in a pop-up hunting blind right next to a waterhole. We had so many different types of animals so close that I was afraid to talk in fear that I would scare them off. About 30 minutes before sundown, a group of warthogs came in and chased off the wildebeest. One wildebeest stood its ground but the biggest warthog came up, grunted and tossed dirt into the air with its tusks in a violent display and sent the wildebeest on its way. That’s when I decided I wanted to take the bosshog. Naude liked the tracking job on this warthog since it was only 6 inches- straight down. 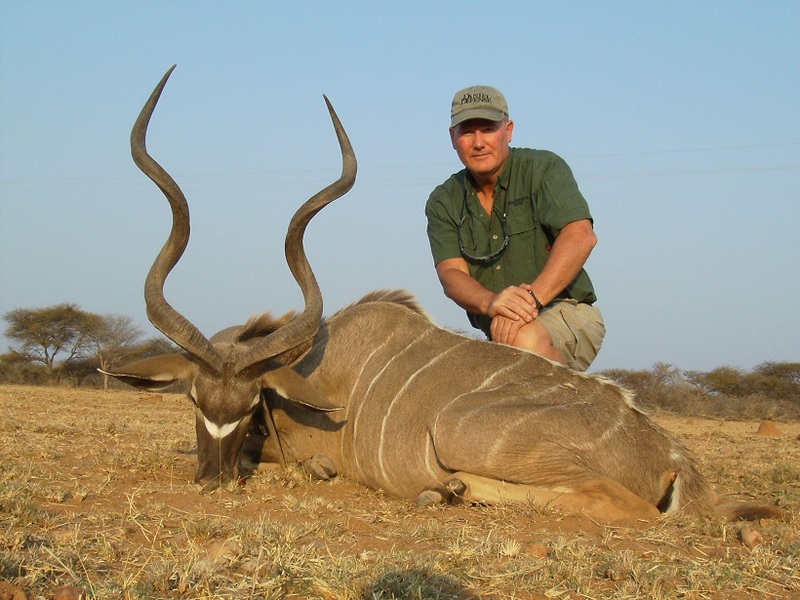 My final trophy was a kudu that I took on one of the most exciting hunt of my life. There was a lot more stalking than spotting on this hunt since we were in really thick scrub. Naude spotted the kudu and we were off. It was dead calm and very hot and my mind was racing back to all those African hunting stories I grew up on reading in Outdoor Life. Every step I took sounded like I was walking on Rice Krispies and sweat was flowing down my back. I followed Naude and tried to place my boots in his prints to minimize the noise. We would take a few steps, wait, listen, look, then repeat. This went on for almost a mile since we were zigzagging trying to pick up the kudu’s trail. What I found out later was that Naude has seen the kudu using its horns to rattle tree limbs and shake off leaves for it to eat. I had heard this “tick tick tick” noise and that was what it was. The kudu would walk and find a tree with some leaves still on it, give it a shake, then eat the leaves that had fallen off. Since I was there in August, this is near the end of South Africa’s winter or dry season and it is a semi-arid country to begin with, so there is not much left for the animals to eat. We would hear this ticking noise, slowly work our way towards it, then try to find the kudu. It was so thick that on one occasion, Naude mouthed “he right there” and pointed to a huge bush but I had no idea what he was pointing at. Another factor adding tension to the massive suspense of the hunt was that this was my last day on safari and it was getting late. We did this hide and seek with the kudu until we came to an opening and Naude leaned back and told me he thinks he knows where the kudu is heading. We duck walked across the opening using the scant bushes as rest stops for my burning leg muscles. We get to the far side and we set up for a shot off the sticks towards an break that is about 75 yards long. Naude thinks the kudu will go one of two ways and if he goes the wrong way, no shot for Don. Naude figures since it’s late in the afternoon, that it will head for water after eating and the nearest waterhole is to our right with the kudu to our left. He sees it coming through the brush and tells me he will stop it in the opening with a whistle. Through the scope on my rifle, at 75 yards, I see a leg step out and then the front half of a kudu comes into the opening and for just a moment, I take a breath and hold it and I wait for the whistle and the stoppage. I hear the whistle BUT the kudu doesn’t stop and all of a sudden I feel the need to quick rush the shot. At the shot, I immediately don’t feel confident about it and I rack another round. I look and I can still see the outline of the kudu through the brush but it is staggering. Naude said I had a good hit on it and to just wait. It wobbles around like a drunken sailor so we decide to put it down for good with another shot. We move a couple of yards to our right and find a hole in the brush and I take the final shot. We turn to each other and we both are shaking. After the handshake, we walk up on it and I cannot believe what a beautiful animal it is. I will never forget the moment.